Let’s face the facts: we can easily take color for granted. Even when we are enjoying the brilliant hues of nature and the masterful shades in paintings, it is hard to be fully aware of the colorful intricacies we are taking in. Case in point: do you know the difference between hues, tints, tones and shades? To some, it comes as a shock to learn that these colorful qualities make up multiple tiers of the color wheel. 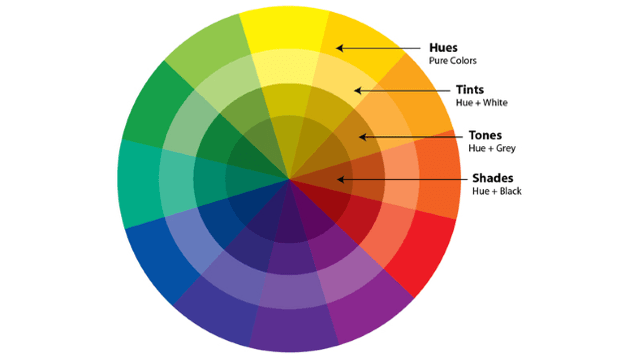 Beyond defining aesthetic color combinations, the color wheel also offers a good starting point from which tints, tones and shades can be properly identified. The color wheel at its most basic form is made up of 12 hues. Hues are pure colors. When white is added to hues, they lighten and become known as tints. When gray is added to hues, they dim and become known as tones. When black is added to hues, they darken and become shades. Different tiers of the color wheel come in handy when decorating, designing graphics, deciding on outfits or preparing works of art. For instance, matching a hue with its complementary shade can make for a dynamic combination. Sometimes, people find hues to be strong and bold. They may prefer light, more whimsical tints or are drawn to the calmer depths of shades. More so, it can be nice to use one hue and its tints, shades and tones. This creates a monotone chromatic color scheme. In the same vein, a monotone achromatic color scheme uses all variations of neutral colors and can be brought to life with a brilliant hue. Did you know the color wheel was so intricate? To learn more about the differences between hues, tints, tones and shades, as well as learn how to pick the best looking combinations for your wardrobe, home décors and art projects, check out this blog post: http://lifehacker.com/learn-the-basics-of-color-theory-to-know-what-looks-goo-1608972072. There is so much to learn about the color wheel, but the most important thing to know is it won’t steer you wrong. How Well Do You Know The Color Wheel? This entry was posted in color theory, color wheel, hues, shades, tints, tones and tagged anaglogous colors, color, color theory, color wheel, colorful, complementary colors, hues, primary colors, secondary colors, shades, tetradic colors, tints, tones on August 14, 2014 by segmation. It *is* a shock — I had no idea, really, about any of this. I’m not saying I’m about to master it, either, just thank you for laying it out.